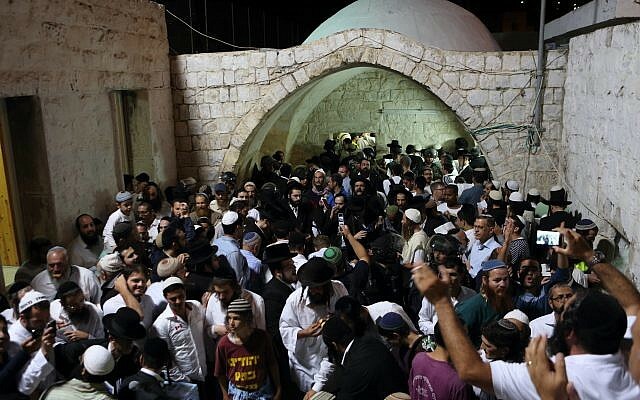 After controlled blast, some 1,000 Jewish worshipers visit Joseph’s Tomb in Nablus, as residents riot and stone their buses. Army sappers detonated a cellphone-operated explosive device that was apparently planted by Palestinians at the entrance to the Joseph’s Tomb holy site in the city of Nablus early Tuesday morning, ahead of a visit by approximately 1,000 Jewish worshipers, the army said. The 1,000 or so worshipers were escorted to Joseph’s Tomb — believed to be the burial site of the biblical patriarch — by IDF soldiers, border guards and Israel Police officers, the army said. According to the military, as the group was leaving the area, local residents began to throw rocks at the troops and the buses, causing no injuries, but some light damage to the vehicles. One of the rioters was arrested, the army said. Elsewhere in the West Bank, IDF troops arrested 10 Palestinian suspects in predawn raids. Two illegally owned guns were confiscated by Israeli soldiers in the town of Silwad, northeast of Ramallah, in the central West Bank. Pilgrimages by Israeli or foreign civilians to the Joseph’s Tomb holy site are frequent catalysts for violence. In the past, Nablus residents have attacked the groups visiting the site with rocks, Molotov cocktails and rifle fire. In August, two Palestinians were shot and wounded by Israeli troops who were providing protection to Jewish worshipers visiting Joseph’s Tomb. Since the IDF Civil Administration, in charge of running Judea and Samaria, will not destabilize the finances of the PA terror regime, defined by the government of Israel since 1993 as a “peace partner,” the initiative to sue Arab terrorists of their assets must come from the victims themselves. Ramati’s first response to the media was to comment on the big, wide smile that the Arab teen was sporting as he tried to kill him. First things first, it has been widely published that the IDF no longer tries to kill potential homicide attackers. Indeed, the IDF only wounded the assailant. Critically, but not fatally. And there was another reason for the smile on the face of the Arab assailant. Only a few hours after these two attacks, the IDF dispatched a team to make plans to demolish the home of the terrorist who is now recovering from his wounds in an Israeli hospital. Why would the prospect of an IDF demolition of his home bring a smile to the face of the assailant? As part of the program to provide an incentive for murder. the PA has offers construct a new home in its stead.In other words, demolition of terrorist homes is now a new incentive to terror. The Israel Civil Administration confirms that after any terror attack, the PA facilitates new investment for new homes, compensation from the PA and new aid from the EU. So what should the government and people of Israel do? The solution : sue to freeze the assets of the terrorist’s family and of the terrorist himself. Even more important, the PA must be sued as an accessory that provides the financial incentive for a 17 year old to go on a vehicular rampage to kill Jews. Secondly, banks in Israel which facilitate PA payments to killers can be sued. Israeli banks which enable the PA to forward gratuities for those who commit acts of murder and attempted murder should be held accountable in an Israeli court of law.